Keeping squirrels out of nut trees is always a challenge. Squirrels are intelligent and persistent and so are not easily scared off or deterred. In many areas most types of squirrels are protected from hunting or from poisoning. Some areas allow the eastern fox tree squirrels to be captured or killed without a permit, but check with your local Fish and Game department or similar authority. Always obtain a permit before capturing any squirrel. 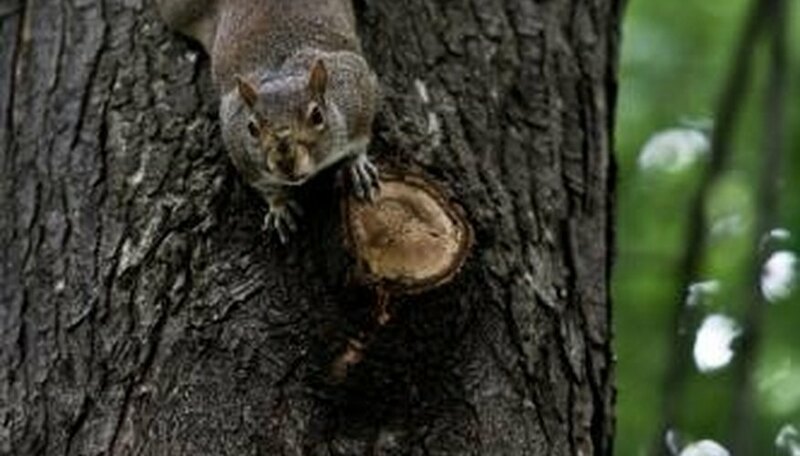 Cut all tree branches that overhang roofs with loppers or a tree saw in order to make it more difficult for squirrels to travel the "canopy highway." Look for ways to trim trees so that squirrels cannot jump from tree to tree. Place nets over nut trees to exclude squirrels. This method will only work for a short time unless other, more readily-available food is provided for the squirrels. Place shallow dishes of acorns along the paths that the squirrels generally use to get into your yard so the squirrels will eat the acorns and ignore your netted tree. Alternatively net several of your nut trees and leave some un-netted, in effect sacrificing some tree nuts in order to protect others. Obtain permits from the Department of Fish and Game (or similar state department in your state) to trap your squirrels. Eastern fox tree squirrels (slightly reddish in color) can often be trapped without a permit, but most other squirrels require a permit and often may be trapped only in specially-approved traps. Squirrels must also be released in non-agricultural areas (such as in large city or state parks). Release a dog in your yard. A dog that chases and barks at squirrels can be a deterrent, but keep in mind that if squirrels can jump from tree to tree and get into your nut trees without toughing the ground, the deterrence of a dog will be greatly reduced. (Cats are generally of little use in controlling squirrels as squirrels will often fight cats). Because of squirrels' intelligence and persistence, devices intended to scare squirrels, such as devices that randomly move or make noise, or plastic owls, seldom work for more than a day or two; squirrels tend to ignore devices designed to scare they away after only a short period of time. Do not poison your squirrels unless your are permitted to do so. Poisoning squirrels without a permit can result in heavy fines.